Heartland rock is a genre of rock music that is exemplified by singer-songwriters Tom Petty, Bob Seger, Bruce Springsteen and John Mellencamp. It is characterized by a straightforward, often roots musical style, a concern with the average, blue-collar American life, and a conviction that rock music has a social or communal purpose beyond just entertainment. Heartland rock is also associated with a number of country music artists including Steve Earle and Joe Ely, along with less widely known acts such as the Iron City Houserockers. The genre developed in the 1970s and reached its commercial peak in the 1980s, when it became one of the best-selling genres in the United States. In the 1990s, many established acts faded and the genre began to fragment, but the major figures have continued to record with commercial success. The term heartland rock was not coined to describe a clear genre until the 1980s. In terms of style it often uses straightforward rock and roll, sometimes with elements of Americana and country. Most artists avoided the synthesizers that dominated the electronic rock of the 1980s and placed an emphasis on guitars, with a basic rhythm and blues line-up of drums, keyboards and occasional horn section instruments like a saxophone. Lyrics are often presented in a style that is raspy and unpolished, adding a sense of authenticity. The genre was most strongly influenced by American country, folk and folk rock acts such as Hank Williams, Woody Guthrie, Bob Dylan, The Byrds, Creedence Clearwater Revival, Van Morrison, as well as the basic rock of 1960s garage and the Rolling Stones. Verses in heartland rock songs often outline narrative stories, particularly of people undergoing hard times; choruses are often anthemic in tone. The genre is associated with rural and blue-collar values, particularly those of working-class regions of the Midwest and the Rust Belt. It has been characterized as a predominantly romantic genre, celebrating "urban backstreets and rooftops", and its major themes include alienation, despair, "unemployment, small-town decline, disillusionment, limited opportunity and bitter nostalgia". Many major heartland rock artists began their careers in the 1960s, as with Bob Seger, or the 1970s, as with Bruce Springsteen and Tom Petty and the Heartbreakers. Springsteen would be the first artist to bring heartland rock to US and international attention, and its most commercially successful exponent. After a series of critically highly regarded, but modestly selling albums with the E Street Band, he achieved his breakthrough in 1975 with Born to Run, which presented stories of loss, betrayal, defeat and escape in the context of his native New Jersey shoreline, with songs influenced by 50s rock and roll, Bob Dylan and Phil Spector's Wall of Sound. While Springsteen struggled for three years with legal disputes, other artists in a similar vein came to the fore. These included Bob Seger and the Silver Bullet Band, Tom Petty and the Heartbreakers, and fellow Jersey Shore residents Southside Johnny and the Asbury Jukes. 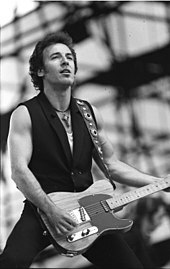 In 1978, Springsteen returned with Darkness on the Edge of Town, which reached the top ten in the US and then the number one album The River (1980), which continued the themes of economic and personal dissolution, produced a series of hit singles, and has been seen as "getting the heartland rock bandwagon rolling", together with the stripped down sound and darker themes of his next album Nebraska (1982). The genre reached its commercial, artistic and influential peak with Springsteen's Born in the U.S.A. in 1984, which topped the charts worldwide and spawned a series of Top Ten singles. The 1980s saw the continued success of famous artists, John Fogerty, Steve Miller Band and the arrival of new artists including John Mellencamp (initially recording as Johnny Cougar) (who has been described as defining the genre in the 1980s), Michael Stanley, George Thorogood, John Cafferty, John Hiatt, Lucinda Williams,, The Tractors(Oklahoma), Kentucky Headhunters, Joe Grushecky & the Iron City Houserockers, and more gentle singer/songwriters such as Bruce Hornsby. A number of country music artists like Steve Earle and Joe Ely also became associated with the genre. The first significant female artist in the genre was Melissa Etheridge, whose self-titled debut album issued in 1988 drew critical comparisons with Springsteen and Mellencamp. Heartland rock had begun to fade as a recognized genre by the early 1990s, as rock music in general--and blue-collar and white working class themes in particular--lost influence with younger audiences. 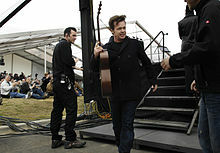 However, although some heartland rock artists disappeared from the scene, others--notably including Mellencamp, Petty, and Springsteen--continued to record with critical and commercial success. Their works have become more personal and experimental and no longer fit easily into a single genre. Newer artists such as Missouri's Bottle Rockets, Illinois' Uncle Tupelo and Wilco or Pennsylvania's The War on Drugs whose music may have been labeled heartland rock had it been released in the 1970s or 1980s, were now grouped into the alt-country category. Heartland rock can be heard as an influence on artists as diverse as Billy Joel and Kid Rock. Kid Rock has performed in concert with John Mellencamp and recorded a duet with Bob Seger for the latter's Face the Promise album. Kid Rock's 2008 hit "All Summer Long" was inspired by Seger's classic "Night Moves" as well as "Sweet Home Alabama" by Lynyrd Skynyrd and "Werewolves of London" by Warren Zevon. American indie rock bands the Killers and the War on Drugs have been associated with the genre. ^ a b c d e "Heartland Rock", Allmusic, archived from the original on 13 February 2011 . ^ a b c d e S. Peake, "Heartland Rock — Profile of '80s Mainstream Genre Heartland Rock", About.com, archived from the original on 1 April 2011 . ^ a b c d e J. Pareles (August 30, 1987), "Heartland rock: Bruce's children", New York Times, archived from the original on 1 April 2011 . ^ a b J. A. Peraino, Listening to the Sirens: Musical Technologies of Queer Identity from Homer to Hedwig (University of California Press, 2005), ISBN 0-520-21587-7, p. 137. ^ T. Weschler and G. Graff, Travelin' Man: On the Road and Behind the Scenes with Bob Seger (Wayne State University Press, 2009), ISBN 0-8143-3459-8, p. xvi. ^ G. Thompson, American Culture in the 1980s (Edinburgh:Edinburgh University Press, 2007), ISBN 0-7486-1910-0, p. 138. ^ K. Keightley, "Reconsidering rock" in S. Frith, W. Straw and J. Street, eds, The Cambridge Companion to Pop and Rock (Cambridge: Cambridge University Press, 2001), ISBN 0-521-55660-0, p. 138. ^ a b c W. Ruhlmann, "Bruce Springsteen: Biography", Allmusic, archived from the original on 1 April 2011 . ^ J. Ankeny, "Born to Run — Bruce Springsteen: song review", Allmusic, archived from the original on 1 April 2011 . ^ S. T. Erlewine, "Steve Earle: Biography", Allmusic, retrieved 16 December 2010. ^ W. Ruhlmann, "Joe Ely: Biography", Allmusic, retrieved 16 December 2010. ^ G. Prato, "Melissa Etheridge: Biography", Allmusic, retrieved 16 December 2010. ^ A. Light, "Bob Seger, Once the Voice of Detroit, Is the Newest Star in Nashville", New York Times, September 3, 2006, retrieved 17 December 2010. ^ "Kid Rock: Rock n' Roll Jesus", Rolling Stone, retrieved 15 December 2010. ^ A. Leahey, The Killers: biography, Allmusic, retrieved 22 November 2012. ^ S. T. Erlewine, "The Killers: Sam's Town, review", Allmusic, retrieved 10 December 2010.